The Duterte Administration pays significant attention in building infrastructures to revive Philippine economy. With these mega projects, it generates employment and as these projects are being completed, the transport and business sectors as well as ordinary Filipinos would enjoy the benefits . 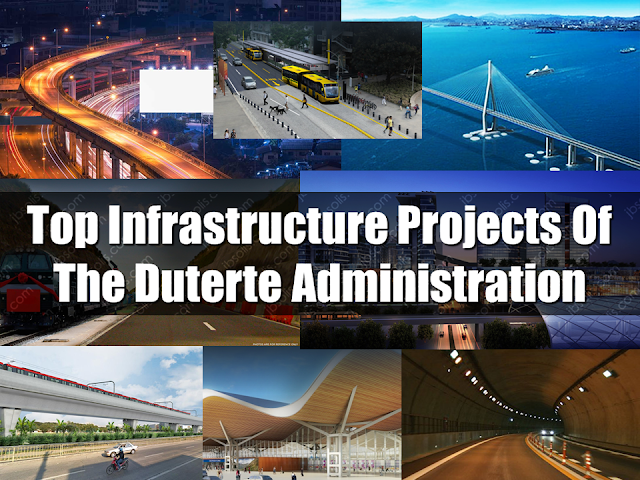 As a product of state visits and negotiations with other countries, President Rodrigo Duterte has raised trillions of Pesos to fund these infrastructure projects. With estimated budget of P150B, A 69.5 kilometer mass transportation railway that will extend PNR North 1, connecting NCR with Clark International Airport and New Clark City. The project will enable a one-way travel time of 56 minutes between Manila and Clark International Airport (CIA), supporting the development of CIA as a major air transport hub. PNR North 2 will be seamlessly integrated with PNR North 1 and PNR South Commuter. The Subic-Clark Railway Project will provide rail connection between Subic Bay Freeport Zone and Clark Freeport and Special Economic Zone, linking Subic Port with Clark International Airport and other major economic hubs in Central Luzon, especially Clark Green City, and forming an integrated logistics hub for the development of Central Luzon as a new growth center to decongest Metro Manila. With estimated budget of P57.6B, the project is expected to be completed on 2021. The Bonifacio Global City (BGC) – Ninoy Aquino International Airport (NAIA) Bus Rapid Transit (BRT) is a mass transport system that will traverse through the Bonifacio Global City, Bonifacio South, Villamor Air Base, NAIA Terminal (1-3) up to Ninoy Aquino Station of the proposed LRT-1 Extension Project. This is part of the Metro Manila BRT System that will help ease traffic congestion. With the growing demand of airports to accommodate the numbers of travellers going in and out of the country, the expansion and modernization of the Clark International Airport would be a great help. With estimated budget amounting to almost P22B, the project aims to construct a new passenger terminal building to accommodate 8 million passengers per annum, as well as the construction and installation of all required associated facilities - both landside and airside, to support the operations of the Clark International Airport. BCDA, in partnership with the Philippine Sports Commission, will build a sports complex inside the Clark Green City equipped with modern facilities for scientific sports training and development of Philippine athletes. With estimated budget of P97B, the project involves the construction of facilities for the National Sports Training Center, Sports Institute, and Athletes’ Village. It will also feature residential and commercial developments to support the activities in the sports complex. Envisioned to become world-class facility, the Philippine Sports City will be considered as a venue for major international sports events such as the Southeast Asian Games. It is expected to be completed on the latter part of 2021. Panguil Bay Bridge Project is a 3.48-km, two lane bridge that will connect the city of Tangub in Misamis Occidental to the municipality of Tubod in Lanao del Norte. Funded under loan agreement with Korean Economic Development Cooperation Fund (KEDCF), the ₱4.9-billion mega infrastructure project is expected to accelerate and sustain the economic growth in Mindanao regions by providing efficient and seamless transport of goods and services. This project is a 73.75 km highway with 2 km tunnel. It is divided into three segments: Talisay-Cebu City-Mandaue (Segment 1), Consolacion-Liloan-Compostela-Danao (Segment 2), and Naga-Minglanilla (Segment 3). Expected to be completed on 2022, it has estimated budget of P18B. This project is expected to reduce travel time from 1 hour and 44 minutes via Pan Philippine Highway and Diversion Road to 49 minutes via Davao By –pass road. It has a budget of almost P20B and expected to be completed before 2023.